Can't view the diagram from work, I'll study it when I get home tonight. Didn't someone here have problems with running through the ECU? and the answer was don't do it that way, just use the Ign switch? Can't you run power from both the IGN and START to a realy (with a diode in each line to prevent feedback?) That must be how the stock setup works for powering the coil. 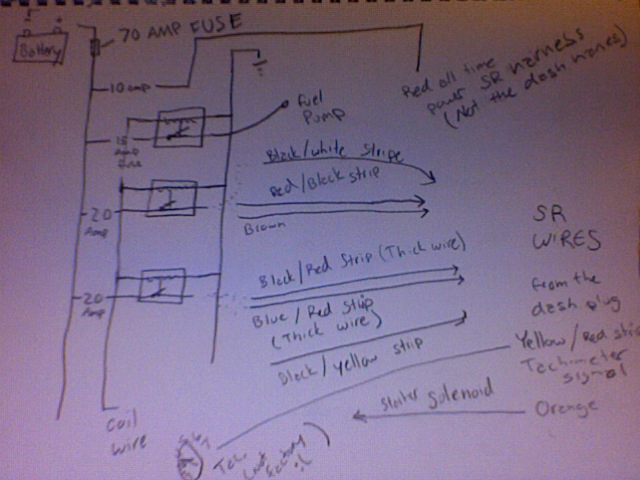 If I remember right the start position bypasses the resister for the coil to allow a little extra spark for starting. The stock setup has the same power requirements as a car running a later motor with an ECU. but for the rest.... anyone can help me out? maybe my ignition switch have been swap, dunno! There maybe some grounds in there, they are ALL BLACK if they have a white strip its not a ground. I gotta go I will add more in a bit..
nice! now I see how to do it! that is pretty much what I was thinking and it confirm that I was in the good way! Sweet, I was kinda worried, as you can see I'm not much of an artist If you have any questions I would be happy to answer them. The "coil wire" is from the 510 harness by the way. The 70amp fuse is out of the stock s13 relay box, make sure to get an extra.